My mom gave me the recipe for these cookies. 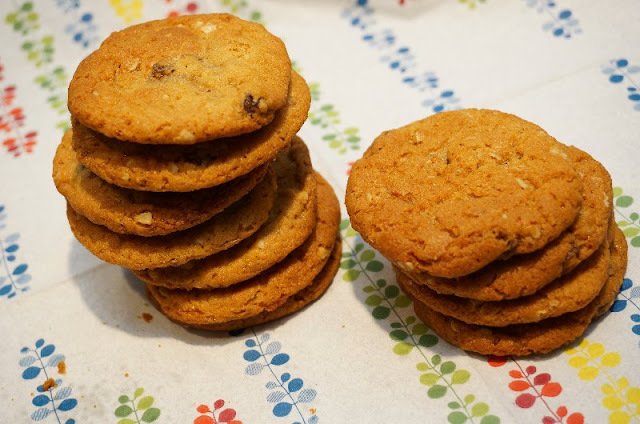 Golden Syrup gives these cookies a unique flavour. the Roger's and Lyle's labels. I have not tried to make them with corn syrup instead of the Golden Syrup but if any of you do, let me know how it turns out. Cream together, margarine, shortening and sugar. Add golden syrup and eggs, mixing well after each addition. Add dry ingredients, mix well and then add raisins. Refrigerate dough for several hours. Roll into 1 inch balls and place on pan. Bake at 375˚F for 10-12 minutes. These are nice chewy cookies that freeze well. 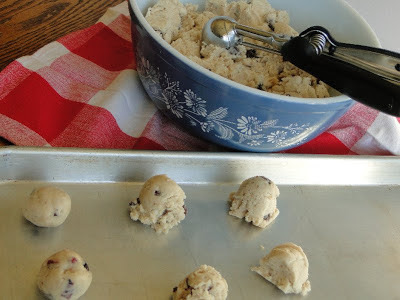 Use a small scoop to make evenly sized cookies. Oh we called them Dad's Cookies. No idea why. As I recall they did become rather hard and crisp, like a gingersnap, which contributed to their keeping property. Really good dunking cookies. These cookies don't get hard because of the raisins in them. I especially like them because they keep their chewy texture. Thank you for that history - I always wondered why they are called Perkins. Interesting names and history! They look delicious! Bev, thank you for posting such a yummy cookie recipe. Made them first thing this morning (possibly minutes after the recipe had been posted...lol) Received many compliments and recipe requests from the gals in the office. They mentioned it brought back memories of cookies that their Grandma had baked. Also, hubby Jack enjoyed the taste & texture(chewy)of these cookies.... thank you again! Name was to say Betty's fav sister, Norma...not sure why it posted like that. I'm so glad you like them Norma - they are a favourite of the guys in the office here too. I'm going to try these tomorrow (my baking day), though being in the USA I will have to substitute with corn syrup. I will let you know about the results with two picky eaters in the house (hubby and 3 year old daughter). Well, I read that GoldenSyrup, once refined, contains Fructose, Glucose AND Sucrose. So If one used honey with a spoonful of molasses,a fairly close approximation , with all the PHYSICAL characteristics so important when baking, could be had! Honey is hydrophilic, so the cookies would remain chewy; the flavor, also, would be pretty close. For non-honey eaters, start with corn syrup and add the spoon of molasses.Best Baking! I have a very similar recipe from my mother in law but she called them Parkins cookies. Wonder where the recipe comes from originally?! My favorite traditional English recipe.Simple post for my Perkins recipe. Parkin is a cake in North England, Perkins are biscuits in Scotland, they are similar and both gingery. There is a story that they were named after Perkin Welbeck, a man in the 18th century who claimed to be the rightful King of England instead of Henry VII. He stayed for a time at the Scottish court as it was politically expedient for the Scottish king. He was hanged by Henry following a failed rebellion in Cornwall.